Wait, Is The Simpsons Losing Harry Shearer? Update: Well, it's definitely official now, as longtime Simpsons showrunner Al Jean has released a very depressing statement through 20th Century Fox. Harry Shearer was offered the same deal the rest of the cast accepted, and passed. The show will go on and we wish him well. Maggie took it hard. 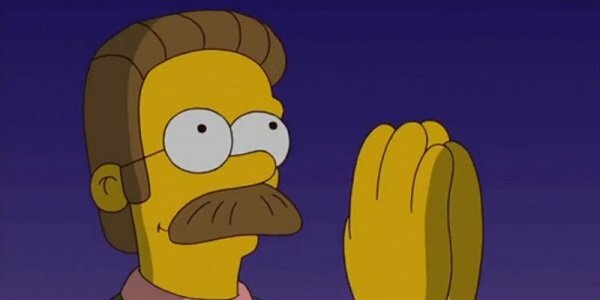 We do not plan to kill off characters like Burns and Flanders but will recast with the finest voiceover talent available. Previous: When it was announced last week that The Simpsons would be extending its run through Season 28, at the very least, lots of people raised Duff cans and Squishee cups to the news. But then it came out that star Harry Shearer was holding out due to contract negotiations that weren’t going his way. And while that seemed like behind-the-scenes noise that would get shushed, it looks like Shearer himself has publicly made it clear that he won’t be returning to The Simpsons next year. Wait, what? Shearer took to Twitter very recently and let his 107,000+ followers in on a statement from Simpsons co-creator James L. Brooks’ lawyer, presumably in reference to the negotiations. That initially just sounds like hearsay from a lawyer – and if Lionel Hutz has taught us anything, it’s that lawyers can’t be trusted – but then Shearer followed that up with his own message. And it’s one that makes me want to run to my mother like Seymour Skinner. I can’t even tell if that’s just Shearer being a smart aleck, or if that’s him genuinely wishing Brooks (or his lawyer) the best. It doesn’t really matter. I really just want Shearer back, because he’s far too important to The Simpsons to let go. I don’t pray much, but let’s all take a kneel down with Ned for a second. Shearer, who won only his first Emmy last year, is as important to The Simpsons as any other actor on the show. Sure, he doesn’t voice anyone in the immediate family, but he’s a huge percentage of the supporting characters. To name just the most critical handful, he voices Mr. Burns, Smithers, Ned Flanders, Skinner, Kent Brockman, Scratchy, Principal Skinner, Kang, Lenny, Dr. Hibbert, Reverend Lovejoy, Otto, Eddie, Jasper, etc. The list goes on, and this show will be a shell of itself without these characters, or with someone else stepping into the role for the first time. In these times where Marvel contracts can afford actors the chance to never work on anything else, TV contracts are a different issue. Shearer has voiced his problems with Fox’s contracts in the past, and it looks like things haven’t changed much. And now that there are no more DVD sales coming, there have to be other ways to make money. Matt Groening, James Brooks, or generic Fox exec…whoever this message needs to get to, just pay Shearer off for two more years. Two more years! Two more years! With or without Shearer, The Simpsons will return to Fox this fall.